Fresno State head coach Bob Bennett looked forward to the 1974 season and he liked what his shortstop Kenn Cunningham brought to the team, according to The Fresno Bee. "Cunningham should add leadership to the infield," Bennett told The Bee that February. Cunning played two seasons at Fresno State. He didn't go on to play as a pro, but he did briefly take his leadership skills to the minors as a coach and as a manager. Among his minor league assignments: Managing the 1990 Bristol Tigers. Cunningham is also sometimes credited as Ken Cunningham. Cunningham grew up in Central California, outside Modesto. He attended Modesto Junior College. In 1972, he recorded nine at bats in an 18-inning game, according to the school's baseball media guide. He then went on to play at Fresno State. 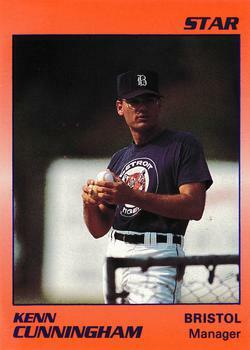 By 1988, Cunningham was in the minors, coaching in the Tigers system. He served as a coach at single-A Fayetteville that year, then single-A Lakeland in 1989, according to his ProCards card. In 1990, he served as manager at rookie Bristol.